There is an obvious distinction between demonstrative pronouns and demonstrative adjectives in Japanese. 'This' and 'that' in the Japanese language are both examples of the former as well as the latter. 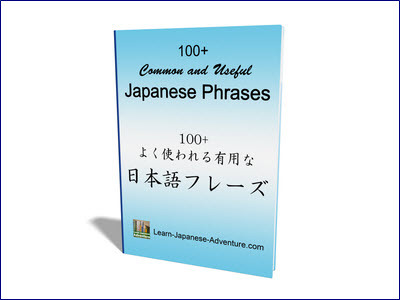 You might have noticed that native Japanese used these three words: これ (kore) それ (sore) and あれ (are) to refer to things or people around them. These three are the most commonly used demonstrative pronouns in Japanese. Unlike in the English language where 'this + bag' or 'that + bag' are followed by nouns, demonstrative pronouns in Japanese are not followed by a noun. 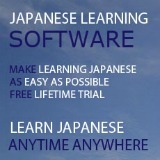 There are three demonstrative adjectives in Japanese: この (kono) その (sono) and あの (ano). 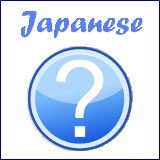 Demonstrative adjectives in the Japanese language are followed by a noun, similar to English i.e. this bag, that bag etc. The three most commonly used Japanese demonstrative pronouns are これ (kore), それ (sore) and あれ (are). While in English we identify objects by "this" and "that", Japanese natives identify objects by "this", "that", "that over there". Meaning: This is my bag. Meaning: That is your bag. Meaning: That (over there) is John's bag. Depending on the situation, sometimes if both the speaker and the listener are close enough, they can consider themselves as one entity. Therefore they can refer to object near to them as これ (kore), refer to object slightly away from them as それ (sore) and object far away from them as あれ (are). There is an associated question word どれ (dore) for these demonstrative pronouns. You can use this to ask question when you want to determine certain object from within a group of similar objects. Meaning: Which (one of these bags) is you bag? These three Japanese demonstrative adjectives modify nouns that follow after them. So the formats are always このNoun, そのNoun and あのNoun. They are used to identify objects in a similar way. Meaning: This bag is mine. Meaning: That bag is yours. Meaning: That bag over there is John's. Notice that when the same noun is repeated in a sentence, it can be omitted, just like the かばん (kaban) in the above examples. 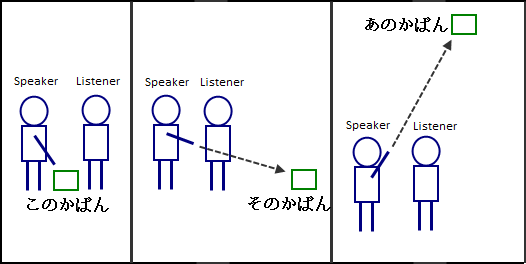 When both the speaker and the listener are close enough, they can consider themselves as one entity and refer to an object/person near to them as このNoun (kono Noun). They would also refer to an object/person slightly away from them as そのNoun (sono Noun) and an object/person far away from them as あのNoun (ano Noun). Meaning: Which one is my bag? / Which one of (these bags) is mine? While これ (kore), それ (sore) and あれ (are) refer to things, another three demonstrative pronouns ここ (koko), そこ (soko) and あそこ (asoko) refer to places. 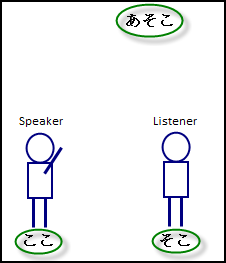 When the speaker regards the listener as sharing his territory, the place where they both are is designated by the word ここ (koko). Under this situation, そこ (soko) designates the place a slight distance away from them, and あそこ (asoko) designates an even more distant location. Question: Where is the toilet? Another three pronouns which are more polite than ここ (koko), そこ (soko) and あそこ (asoko) are こちら (kochira), そちら (sochira) and あちら (achira). These three not only refer to places; they can also be used to point someone in a particular direction. The associated question word is どちら (dochira). 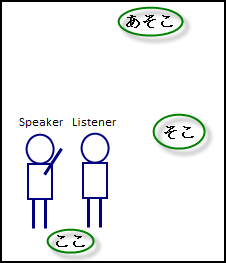 In summary, the こ・そ・あ・ど series of demonstrative words are shown as above. 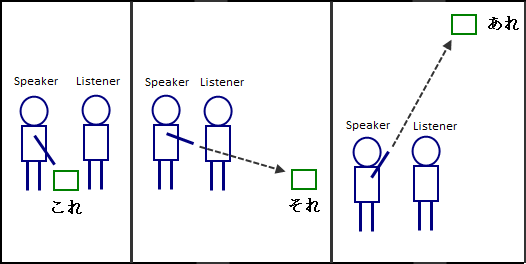 Intermediate Lesson 32: Japanese Demonstrative Expression using そ and あ.